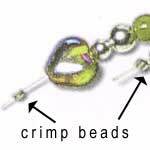 This technique here shows how with the use of crimp beads, you can create dangles or finges for bracelets and necklaces. 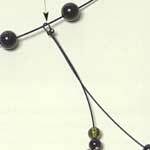 Here the dangles are so placed to create sectional, floating finged dangles. The use of "invisible" threading here really helps to create a true floating design as the threading 'disappears' when worn. The technique here will illustrate how to achieve the design you want. It is not a step-by-step from beginning to finish on how to create the pictured necklace. 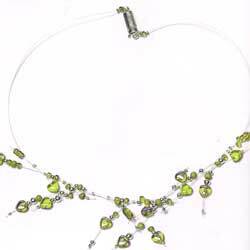 1) Use beading wire to create the dangles you want for your design. Cut appropriate lengths (which will be folded over to create the dangles). 2) Fold a 'dangle-wire' over the main necklace thread. 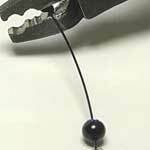 Thread both ends of the dangle-wire through a crimp bead, crush the crimp bead to form a loop. 5) Continue in this way to create the sectional floating sections with dangles along your necklace. 6) finish off the piece with a clasp of your choice.